A bad credit report can harm you in many ways, from raising interest rates on car loans and mortgages to eliminating any possibility of getting a loan. In today’s troubling economic climate, it has become common for people to have their credit score suffer from circumstances beyond their control. Contact Attorney Kenneth Carp, Lt. Col., USAF (ret.) at (636) 947-3600. He understands the credit reporting agencies and their process and as a Bankruptcy attorney for over twenty years. With more than 20 years of legal experience, our St. Louis-based firm strives to provide detailed guidance to clients in Missouri and Illinois. Our staff strives to offer the detailed advice you need to understand your various options. Contact us at (636) 947-3600 to schedule a free consultation to discuss your specific concerns and learn how we can be of assistance. There may be inaccuracies in your credit report. Have you filed bankruptcy but the discharged debts are still being set off by the collection agencies? Are there inaccuracies in your report? Attorney Kenneth Carp can help. Contact Attorney Kenneth Carp and he will look into all possible solutions for your individual situation, including approaches that could improve your credit score and allow you some financial mobility. Maybe you want some strategies on how to improve your credit score. We can sit down with you and your report and give you ideas on how to make your credit score more appealing to potential lenders. Rest assured, you do have options and it is never too late to start fixing problems. Our lawyers are dedicated to providing personalized support to every client we represent. Operating under that philosophy, we conduct a careful examination of your situation and your goals before offering the tailored advice you need to find resolutions. This personalized representation often allows us to find effective solutions to difficult problems. The attorneys at The Law Office of Kenneth P. Carp, PC know the rules of credit reporting, debtor assistance and the Fair Debt Collection Practices Act, and we put them to work for you. 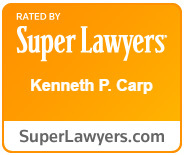 With over 20 years of court experience, our senior attorney Kenneth Carp, a retired Lt. Colonel with the US Air Force, has the right experience to represent you. Call (636) 947-3600 to schedule an appointment.